So what do we have behind ours? Behind the gates and behind the house, we've got a fence in our backyard too. This separates the garden from the house. It's much brighter than this picture, as my host mom and I repainted before the winter came. Behind the house, we've got a small garden, an outdoor shower (on left in this picture), and fields. We've also got a "casa veche" right by the house, which means "old house." Sometimes these are called "casa mica," which is "little house." They might include bedrooms, kitchens, or storage rooms. They could be literally a little house and include almost everything. When I first moved in, we would eat in the casa veche, but now that we have a kitchen in the big house, I personally don't use it for much. One part of it is where we keep potatoes and 300 huge sacks of flour for baking (slight exaggeration). In the main house, we have a kitchen (this is new-ish, we didn't have one when I arrived. My host mom would cook on hot plates, usually outside. Now we have a stove and cabinets and a warm, colorful place to eat and entertain. ), a bathroom, two bedrooms, and a few rooms that aren't used for much. Occasionally we will entertain in one of them, but mostly they are empty. Moldovan houses sometimes have a room where they keep their nice things, and that room might be used for big get-togethers. One of my favorite things about some Moldovan houses is the metalwork on them. This is right in front of our front door, and the detail is just so cool! I first started noticing these works of art while in my training village, and I was really happy to see that my house at my permanent site had a great big one - it felt like a sign. "I can see Ukraine from my house!" But seriously. One of my favorite weekend activities is to bring a glass of wine or mug of coffee out to our back balcony and sit there to read, looking out at the valley. Some nights there are a million stars, some afternoons there are people working in the fields, and some mornings everything is covered with a fresh blanket of snow. Though I called it one, it's not technically a valley that I'm looking out at. In the village (and in Moldova in general), we call anything that's above us in elevation "the hill." Anything below us is "the valley." This river separates our fields from the valley. My host dad built this bridge once the family realized I like going for walks or jogs in the valley. I'll usually pass a few cows, and occasionally a horse or two. My host family doesn't have too many animals. I've been told that they used to have cows, but now all we have are chickens and a few dogs. In the summer and fall we'll have geese, but they'll all be killed and canned before winter comes. When the weather is nice, the birds sometimes get to roam free, but they never escape the gates. We have two wells, which are usually where I get my drinking water from, but we have running water in the house, too, so I often use that as well - after boiling and filtering it. As far as conveniences go, we are fortunately equipped with a shower, indoor toilet, and even wifi - my host mom likes to Skype with her son in America almost every day, and I also might enjoy the use of the Internet. We're currently heating our house with wood and charcoal in a soba, or stove that heats the whole house. 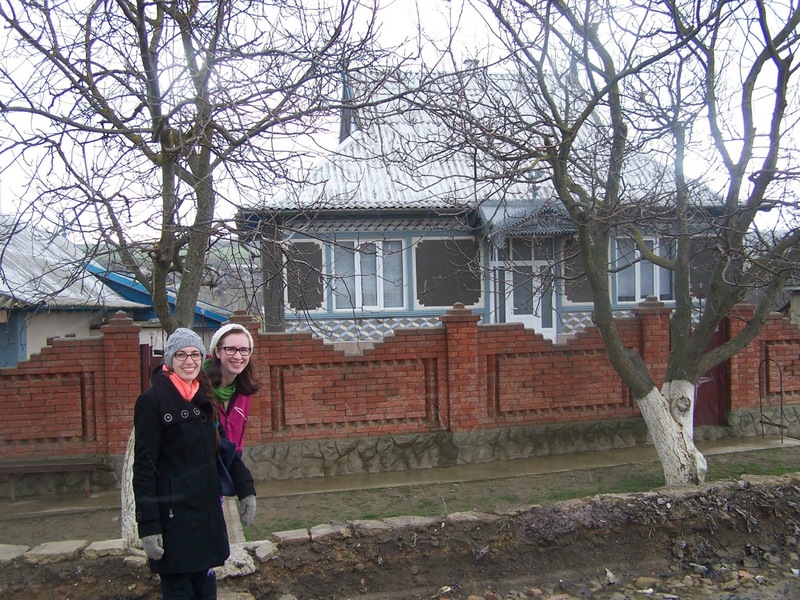 My house is very comfortable, so I'm fortunate in that respect, as many other Moldova PCVs don't have all those luxuries. I enjoy my little space in the house. You can either find me in my room, the kitchen, or outside on the balcony when the weather is nice (or if my host mom isn't home to scold, when it isn't nice! Sitting outside under the cover of the balcony is lovely during a rainstorm, or even when it's cold, as long as I bundle up!). We've got a lot behind our red gates! This is part of the #BloggingAbroad Blog Challenge!